Tracy Townsend didn’t take the most direct route to the pipeline and utility industry. She has spent the last 17 years at Washington Gas, the 170-year-old local distribution company that serves Washington, D.C., Maryland and Virginia. Once upon a time, though, she thought about becoming an attorney. Instead, Townsend found herself in the underground construction realm, pioneering a strategic alliance program between a local distribution company and a contractor. Her efforts showed it was both possible and practical to lower costs while installing capital assets. Through collaboration and communication Townsend negotiated a partnering between Washington Gas and NPL Construction Co. that has had a lasting, positive impact on the two companies, serving as an example for the industry at large, says Mark Bridgers, principal at Continuum Capital. 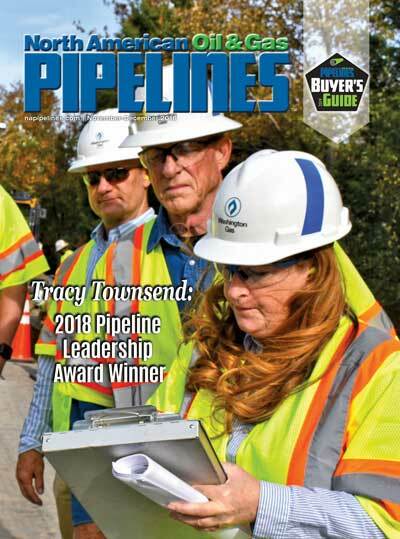 Townsend’s ability to collaborate, communicate and lead in the development and implementation of the strategic alliance program at Washington Gas is why she is the 2018 Pipeline Leadership Award recipient. The Trans-Alaska Pipeline System winds its way 800 miles south from Prudhoe Bay to Valdez, Alaska. Construction on the project began in 1974, and the first barrel of crude oil started flowing through the pipeline in 1977. It was during this time that J. Patrick Tielborg got his start in the industry he would serve for the next 42 years. At the urging of his wife, Julia, Tielborg worked on the Trans-Alaska Pipeline System — or TAPS as it’s often called — during the summers of 1975, 1976 and 1977, while attending law school at St. Mary’s University, in San Antonio, during the spring and fall. After he earned his law degree in 1978, the pipeline industry called to him again. He answered an ad for the Pipe Line Contractors Association (PLCA) to serve as executive secretary, and he was hired in September of that year by the PLCA and two years later became a member of Akin Gump Strauss Hauer & Feld LLP, the law firm that represents the association. Tielborg would go on to serve the PLCA and its more than 200 members for the next 39 years, becoming managing director and general counsel for the association in 1995, the same year he became a partner at Akin Gump. Throughout his career, Tielborg has negotiated dozens of national and project-specific labor contracts with the four major craft unions — the Teamsters, the Pipe Fitters, the Laborers and the Operators — to maintain labor peace in the industry. During his tenure, PLCA members have successfully built hundreds-of-thousands of miles of domestic pipeline. He also oversaw the establishment of the PLCA Safety Committee to promote safe working practices and the association’s scholarship program, which has benefited more than 225 recipients. 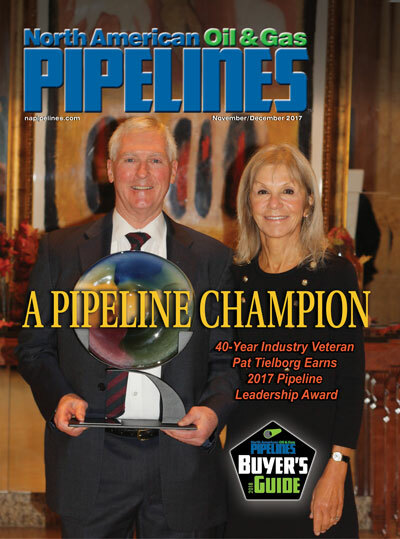 It is for these accomplishments that Tielborg has been named the winner of 2017 Pipeline Leadership Award. Pat Michels has guided Michels Corporation’s ascension in the North American oil and gas pipeline industry, steering its advancement during economic boom and recession. Since Pat became president in 1998, Michels has expanded from seven operational divisions to 18. In the past decade, Michels has climbed from the 93rd to 34th largest contractor and No. 1 pipeline contractor in the U.S. 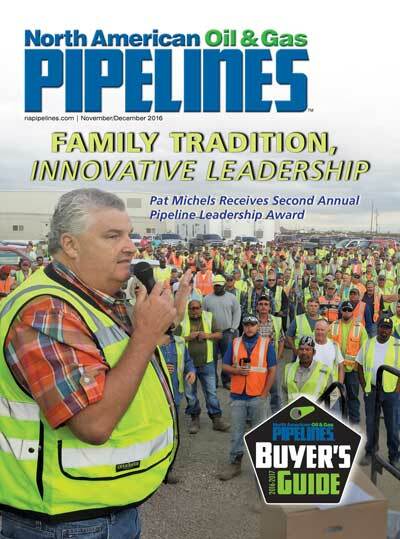 Under Pat’s leadership, Michels has assembled a team that constructs some of the largest transmission projects in North America and stands out in the industry for diversity with stations, integrity management, pipe fabrication and distribution pipeline teams. In all, Michels has nine divisions that influence the gas and oil industry. Pat has created a culture in which excellence is expected. One example is Michels’ position among the most highly regarded HDD contractors in the world. Along the way to achieving records, Michels has provided customers with possibilities for safe construction of pipelines in areas that would otherwise be considered impossible. In the same vein, Michels has embraced Direct Pipe technology, pushing its limits beyond initial expectations. Pat is a champion of safety and quality, supporting Michels’ full-time, dedicated safety, environmental and quality control programs, which were among the industry’s first. Whenever possible, Pat visits rights of way and leads JSA meetings. Pat and his family also vigorously support the communities in which Michels operates and in the industries it serves. This includes the Dale R. and Ruth L. Michels Family Foundation, Dale Michels Center for Heart Care and Michels Scholarship Fund. 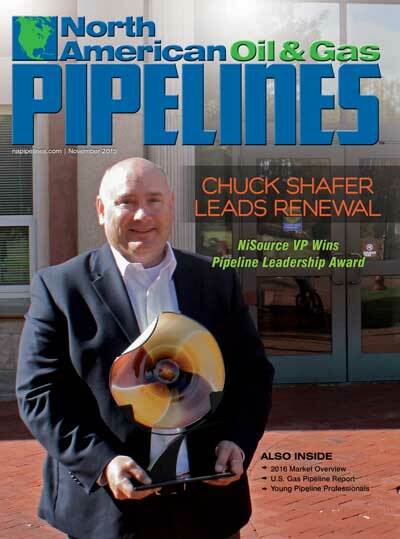 2015 Winner: Chuck Shafer, NiSource Inc.
As vice president of engineering, projects and construction, Chuck Shafer has been an integral part of a major capital improvement and modernization program to update NiSource Inc.’s natural gas system, which serves approximately 3.5 million customers across seven states. In 2007, NiSource began the discussion for the modernization program, which officially turned dirt for the first time in 2008. One of the things that make the program a success is a strong and consistent message from NiSource leadership that allows Shafer and his team and all of the partners to look at the long-term big picture. NiSource invests approximately $1.4 billion a year on energy infrastructure improvements between its gas and electric customers. The overarching goal is to meet and improve upon the utility’s customer commitments for the next 100 years. During the 20-plus year modernization program, NiSource expects to spend $20 billion on its gas system. In 2006, the system had 40,471 miles of distribution pipeline and 334 miles of transmission class pipeline, of which, 8,000 miles was bare steel, cast iron pipe. The company tackled its highest risk facilities first and since the program’s inception, NiSource has been able to reduce its priority pipe (bare steel, cast iron) from comprising 21 percent of its system to 15 percent.